Rachel Mica Weiss creates sculptures and installations embedded with gravity and tension. Her installation practice is rooted in the craft of weaving—its technical processes, historical uses, and relationships to architecture. Her thread installations, hand-strung on site in a fashion mimicking the warping of a loom, are super-saturated yet diaphanous planes of color that confront the viewer with an unexpected strength. Her monumental rope installations are walls or arcs of color that command space, engendering feelings of vulnerability and underscoring the laborious processes of their fabrication. By interrupting natural passageways or highlighting existing architectural elements, Weiss draws attention to the constraints within our physical and psychological spaces, and in so doing, shifts them. Weiss’s sculptures combine textile languages with the density of stone, cast forms, and wood constructions. 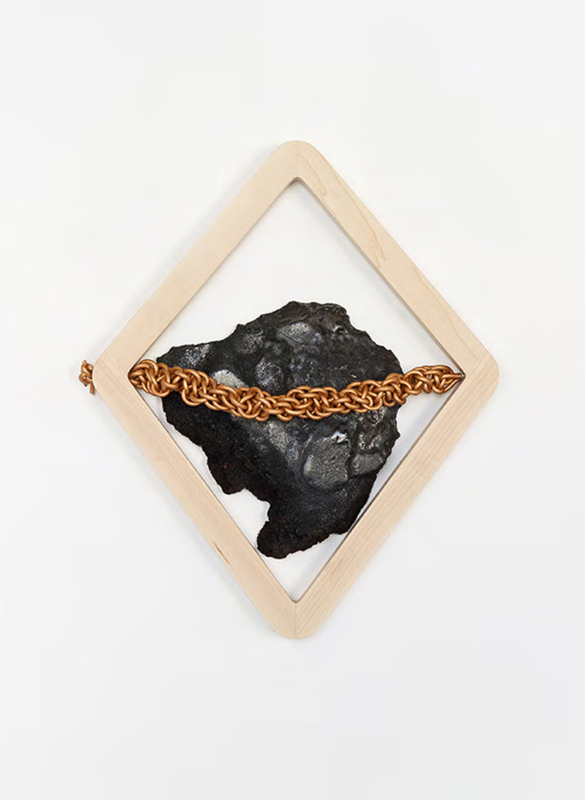 The Chained Portraits series extends the artist’s ongoing conversation about restraint and material assumptions begun by her first series of Portraits (Portraits #1-#3) in 2014. 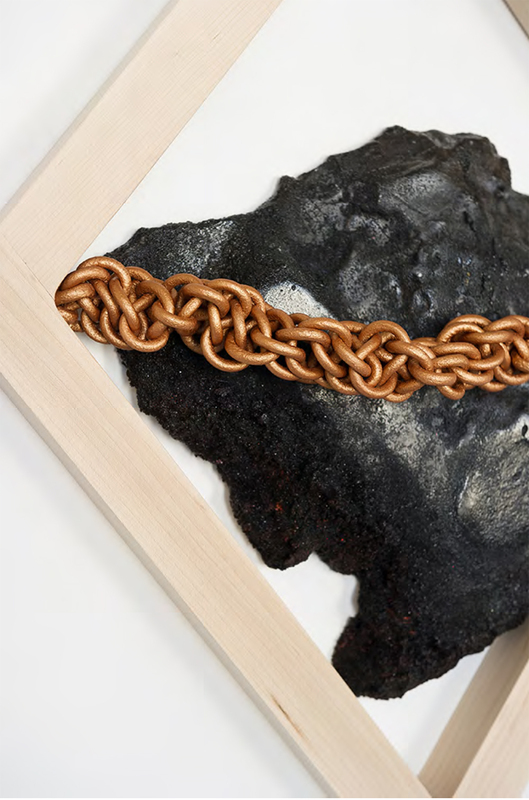 More playful in nature, hand-braided leather (which initially reads as chain) interacts with cast “stones,” seemingly holding them in position, while the frames bordering these stones appear to hold the chain in a cyclical relationship of control. Viewers question their assumptions about the makeup of the materials themselves, as well as their respective weights and capabilities. Once the unique and somewhat mysterious cast objects in these Portraits draw viewers in to investigate, they each showcase their “hidden” details and qualities. The geode-like areas on each underscore them as precious objects to be held on to, captured, and retained in the maple frames which highlight their value.